I think the Easter Bunny is really a golden dog with rabbit ears, because the ever delightful Miss Harper Lee brought Shoeful of Drool a Missy Award nomination! You must post the award picture on your blog. 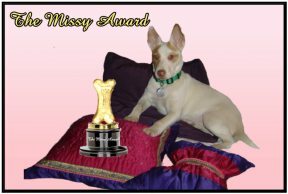 Link back to The Missy Award. And answer these two questions: What inspires you to write? Why do you love animals? Nominate other worthy bloggers (whatever number you’d like), or you can simply accept the award and complete only Steps 1, 2, and 3. Finally, please let your nominees know you nominated them. What inspires me to write? I’ve always enjoyed writing, and it comes fairly easy to me. Short pieces anyway, as much as I’d like to write the great American novel, I’m not sure if I have it in me. It’s an emotional outlet. I love to laugh and to make others laugh, but I can go to some dark places in my head and writing about them is considerably wiser than attempting to go to those places in reality. I also hope that I occasionally offer useful information that makes someone’s world just a little bit better. Why do I love animals? Unlike people, animals have no guile. At least I think it was just a coincidence the time I saw a squirrel kick a pine cone toward Dudley and not some cunning scheme the squirrel concocted. It was really funny, Dudley and Zoe were barking and raising all kinds of Cain at the squirrel, and the squirrel was chattering away on a branch of a pine tree and it looked like the squirrel had a Bobby Knight moment and flung the pine cone toward Dudley. I think it was just time for the pine cone to fall. Animals make people laugh. Petting a dog can reduce blood pressure, some can even alert humans to an impending medical condition. The provide search and rescue assistance. They alert our soldiers to mines, bombs and IEDsy. They listen with no judgement and when they come and put their head in my lap and sigh, it always makes me feel better. Dogs especially are joyous creatures, and we should take our cues from them and bring more joy into our lives. I want to nominate my friend Kelley Chisholm who writes Kel’s Cafe All Things Food. Her blog has some excellent vegetarian and vegan recipes. She also has recipes for the carnivores. Every now and then, she throws in some recipes especially for the dogs. I know she’s gone pescatarian for several long stretches where the only meat she eats is fish. I think she tried to stick to a vegan diet for a few weeks. 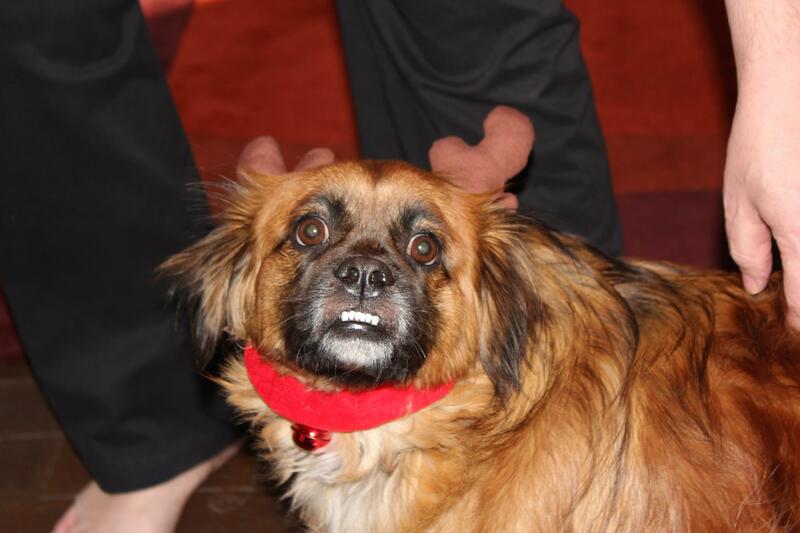 She adopted Lillie from Saving Grace Animal Rescue and Lillie is another member of the family. The fact that she brought Lillie and a nice Merlot over Saturday and is going to let me dog sit Lillie while she takes a trip to New Orleans had no bearing in my decision to nominate Kel’s Cafe All Things Food. But it was really good wine and she is truly an animal lover! I also want to nominate Marcela who writes a great blog called All My Canine Companions. Marcela is certified in pet first aid and CPR. She has a beautiful dog named Alex who she wraps in a blanket when Alex seems cold. Marcela also offers in house boarding to clients and we hear about the adventures of Alex and her friends Walter, Josie, Roxie and others who drop by to stay for a few days. I think this is a wonderful service Marcela provides, I would love to board my dogs in someone’s home that I know will take great care of them. She walks her charges and takes care of them just as lovingly as she takes care of Alex (who is on bed rest at the moment for a soft tissue injury). I also want to thank Harper Lee once again for her nomination and the happiness her blog brings me. Her wry observations and beautiful photos have made these 100+ days without Dudley a little more bearable. This entry was posted in Uncategorized and tagged All My Canine Companions, animals, canine, dogs, Dudley, Kel's Cafe All Things Food, Missy Award, Zoe. Bookmark the permalink. Thank you for the kind words. You are so sweet, and I cannot wait to visit your nominated blogs. Congratulations on your well-deserved Missy Award!